High-powered box mods are all over these days. Options offering over 200 W are surprisingly common, but not many vapers really venture into wattages quite so high. For a more everyday vaping device, finding the best 100 watt box mod strikes a nice balance between something that can still put out impressive amounts of vapor but doesn’t venture into overkill territory. So what are the best devices in this wattage class? If you don’t think the highest wattage is necessarily the best wattage for vaping, here are 10 awesome devices to consider. This device pushes the wattage a little beyond 100 W, but if you’re looking for the best 100 watt box mod it’s still a great option. The Oceanus from Innokin takes slightly larger-than-usual 20700 batteries, which has the benefit of comfortably supporting higher-wattage vaping while still offering excellent battery life. The Oceanus is a fairly compact vape mod, measuring around 3 and half inches tall, around 1 and a half wide and less than an inch thick, making it a great mod to use on-the-go. As the name suggests, it supports wattages up to 110 W, and it can be used with coils as low as 0.1 ohms in resistance. It has a small OLED display screen on the front face, with two adjustment buttons for dialing in your setting and a fire button on the front edge. It’s 510-threaded, so it works with the vast majority of tanks on the market, and comes with the Innokin Scion sub ohm tank as part of a kit. The performance you get from the combination is excellent, but the Oceanus is a great 100 watt box mod when paired with any tank. 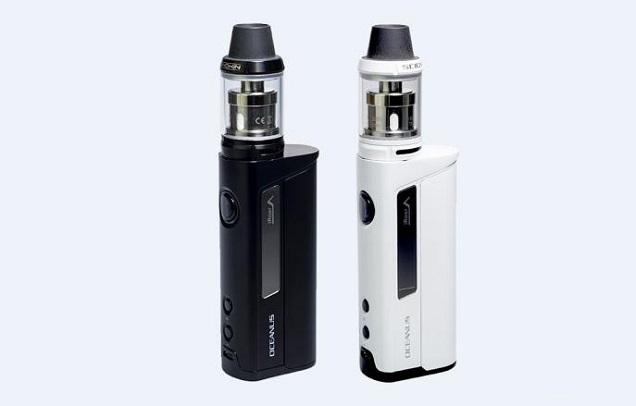 The kit costs $79.95, and comes with the mod, the tank, two 20700 batteries (3,000 mAh capacity), an RBA head and replacement glass section for the tank, a pad of cotton, a screwdriver and a micro USB cable for charging. The Nebula 100 W TC from Vaporesso has an imposing-yet-stylish appearance and a maximum power output of 100 W, putting it in the running for the title of best 100w box mod. The device has an ergonomic design, with a trigger-like fire button on the front face, sitting above an OLED display and three buttons for adjusting settings and changing mode. The mod is unique in that it takes either a 26650 or an 18650 battery, with an adapter included for using the device with an 18650 battery. The result is an excellent mod with more flexibility than most of the options on the market. You can vape at up to 100 W on a 26650 battery – making it a solid 100 watt box mod with the larger batteries – but it does max out at 80 W with a standard 18650 battery. The minimum wattage in both cases is 5 W, and you can use it with coils as low as 0.15 ohms in either wattage or TC mode. The temperature control function works with nickel, titanium or stainless steel coils, and allows you to choose a maximum temperature anywhere between 280 to 600 °F (140 to 315 °C). Both modes offer the option of setting a custom power or temperature curve, to give even more control over your experience. It also works in a more mech mod-like bypass mode if you just want the raw battery output with no adjustment. You can pick up the Nebula for $56.95, which is a great price for one of the top 100 watt box mods on the market. It comes with an adapter for 18650 batteries and a USB cable you can use for charging. The Tesla Two 100 W is a beast of a mod, making this list for its no-nonsense design and excellent performance with a wide range of atomizers. The Tesla Two is unlike most of the options on this list because it works like a mechanical box mod, with just one button to fire your coil and nothing else. This makes it a great 100 watt box mod for newer vapers who don’t want their experience complicated by screens, menus and adjustment buttons. The Tesla Two’s simple, admittedly blocky but sturdy design makes it about as easy to use as a mod can get. The Tesla Two has a standard 510 connection for your atomizer – with a silver-plated copper electrode for conductivity – and works with any setup with a resistance between 0.1 and 3.5 ohms. To get the full 100 watt box mod experience, you’ll need to use a low-resistance coil, since you can’t directly adjust the amount of power going to your coil. One of the best things about the Tesla Two is the massive 4,000 mAh internal battery, which is more than enough to keep you vaping through a whole day and likely longer. The LED light around the fire button changes from blue to red as the battery runs down, and it can charged via USB. The Tesla Two is a great option for vapers on a budget, priced at just $35.95 for the device. This makes it one of the most affordable devices on this list. Most vapers know about the iStick series from Eleaf: they’re always affordable devices and usually perform well. The TC 100 W is one of the best yet, with an impressive power output, a full-featured TC mode and a cool firing bar design which makes it really comfortable in-use. The device runs on two 18650 batteries, which you’ll need to pick up separately, but the performance is excellent, and the dual batteries maximize battery life. It can also work as a single-battery device if you don’t mind reducing the power output a little. The device has rounded edges, with a small display screen on the front face, two adjustment buttons and one extra button for selecting the mode you’re using. With two batteries, the iStick 100 W is a true 100 watt box mod, but with one battery it maxes out at 75 W, with a minimum resistance of 0.1 ohm. As well as standard wattage mode, the iStick TC 100 W also works in bypass mode (in the same way as a mech mod), and offers TC vaping with nickel, stainless steel and titanium. You can set any temperature from 200 to 600 °F (100 to 315 °C) in TC mode, and the minimum resistance is reduced to 0.05 ohms. There are also three memory mode settings on the device you can use to save your most-used settings for quick recall. The iStick TC 100W is the most affordable entry on this list, priced at just $29.95. The Coolfire IV from Innokin has been around in various forms for a while, and the 100 W TC version makes this list for its excellent design, sizable internal battery and impressive performance all-round. The device has a rounded design, with a front face bearing the OLED display screen, a comfortably-positioned fire button above it and two smaller buttons for setting adjustments below. It comes with an in-built 3,300 mAh battery, and charges quicker than most mods thanks to the 2A input. It has a gold-plated and spring-loaded 510 connection, so you won’t have issues connecting up with pretty much any tank on the market. You can set the wattage anywhere from 1 to 100 W, giving you plenty of power and responding just 0.2 seconds after you press the fire button for a really responsive vaping experience. It reads your coil’s resistance really precisely (down to five decimal places), and works with any coil above 0.1 ohms in wattage. When it comes to the standard power output mode, it does a really good job for a 100 watt box mod. It also has a well-equipped TC mode, supporting nickel, titanium and stainless steel, with settings between 300 and 600 °F (150 and 315 °C) and an adjustable ramp-up wattage between 25 and 100 W.
The Coolfire IV 100 W TC is quite affordable for one of the top-rated 100w box mod options on the market too, costing just $38.97 for the device. The KBOX series from Kanger includes some excellent devices, but the 120 W version makes this list thanks to its substantial power output and great design all round. It’s technically a 120 watt box mod, but this isn’t much over the 100 W threshold and the price is excellent. The device runs on two 18650 batteries – which you have to purchase separately – which are inserted by opening a panel on one of the large faces of the mod. Most of the action happens on the front edge of the mod, which has the fire button, the OLED display screen and two buttons for adjusting your settings. The KBOX 120 TC offers ordinary wattage-based vaping from 7 to 120 W, and supports any coil down to 0.05 ohms in resistance. The Infineon chip included on the mod keeps the power output really consistent too, so you get a more consistent vape than you’ll find with many of the 100 watt box mod options on the market. The TC mode on the KBOX 120 supports titanium, nickel and stainless steel, adding nichrome support for TC, which is something you won’t find on most devices on the market. The KBOX 120 costs just $34.95, which is a fantastic deal for one of the best-performing 100w box mods on the market today. The iJoy Capo is a bit of a departure from the other devices on this list because it’s a “squonk” mod. This means it incorporates a bottle into the body of the mod (a 9 ml bottle in this case), which you use to feed e-liquid directly up to the deck of a rebuildable atomizer. In a nutshell, this offers the RDA vaping experience with the convenience of a tank-based system. The Capo runs on a single battery, with a 20700 option included when you pick up the mod, but with the option of switching this out for a 21700 or a standard 18650 option if you prefer. The device looks a little like the iStick Pico, but with a big front-facing OLED screen with two setting adjustment buttons below it. The fire button is located just above the hole to push the squonk bottle, and it’s nice and big to make the 100 watt vape mod comfortable to use. As the name suggests, it offers up to 100 W of power with one of the bigger battery sizes, and it supports resistances down to 0.05 ohms. It supports TC vaping with all common materials, and works in a temperature range of 200 to 600 °F (100 to 315 °C), with adjustable TCR. The device comes with the iJoy Combo RDA Triangle, which features a bottom-feeding pin so you can use it as a squonking device. The 100 watt box mod is a little more expensive than many options on this list, at $66.95, but comes with the device, a 20700 battery, the RDA, a squonk bottle, a tool pack for rebuilding and an adapter for using the device with 18650 batteries. GeekVape has some excellent devices on the market, ranging from RDAs and RTAs through to high-quality mods. The 100 W Aegis makes this list thanks to its impressively durable design and faultless performance. The Aegis is fully waterproof, dust-proof and shockproof, putting it far ahead of much of the competition if you’ll be vaping in unusual situations. It’s designed to run on a chunky 26650 battery, but you get an adapter for 18650 batteries with the device as standard. It also works with 20700 and 21700 batteries. As the name suggests, it runs at wattages up to 100 W provided you use a suitable 100 W battery (unfortunately not 18650 size options). The device has a really clear display screen, two buttons to adjust your main setting and a big fire button, making the mod both easy to use and comfortable. It offers temperature control vaping with nickel, titanium and stainless steel coils, and also has a bypass mode so you can use it more like a mechanical mod. There’s also a “vaping power curve” mode which allows more fine control over your wattage throughout the course of your draw. The mod is also really responsive, reacting to your button-press in less than 0.02 seconds. The Aegis is a fantastic entry onto this list, performing excellently, standing up to more abuse than most mods on the market and being absolutely packed with features. You can pick up the mod, a 26650 battery, an adapter for 18650 batteries, a silicone film covering and two spare screws for $74.95. The Vex 150 TC is a little overpowered for this 100w box mods list, but if you’re looking for a really capable device that packs a punch, it’s a fantastic option. The Vex 150 TC runs on two 18650 batteries, which gives it an edge over many of the 100 watt vape mod options on the market when it comes to battery life. It has a simple boxy design, with a clear OLED display, a fire button and two adjustment buttons on the front edge, along with a simple hinged door at the bottom for inserting your batteries. The display gives all of the information you need about your coil, current setting and the remaining charge in your batteries. The Vex operates at any wattage from 1 to 150 W, which gives you a huge range to work with that will suit most vapers’ needs. The Vex works with any coils between 0.1 and 3.5 ohms in VW mode, so you can run almost any sub ohm tanks and rebuildable atomizers on it comfortably. The 100W vape mod also supports TC vaping with nickel, titanium and stainless steel coils, as well as having an adjustable TCR option so you can really tailor your TC performance to suit your needs. The minimum resistance in TC mode is reduced to 0.05, so it can support basically any TC coil on the market. The performance in both modes is excellent, and it also features a bypass mode if you want a mech mod-like experience. The Vex 150 TC is available for $74.99, and comes with the device itself and a USB cable you can use for charging. Despite the slightly higher power rating, this is a really awesome device for anybody looking for the best 100 watt box mod. You can read our review of the Vex 150 TC here. Taking the top spot in our best 100 watt box mod list is the latest from Innokin’s wildly-popular MVP series, the MVP 4.0. This is a box mod with a simple, unassuming look that does a great job in terms of performance. It has a basic box mod shape, with a front panel featuring an OLED display screen, with two adjustment buttons and a square, protruding fire button. The mod comes with a substantial 4,500 mAh internal battery, which will comfortably keep you vaping for over a day on a single charge. It has vape-while-charging technology, and can even be used as a power pack thanks to the USB output port on the back side of the mod. The MVP4 is a true 100 watt box mod, offering variable wattage vaping at anywhere from 6 to 100 W in standard mode. It works with coils down to 0.1 ohms in resistance, and responds within 0.2 seconds of you pressing the fire button. Combined with the substantial battery life, this puts it up there with the best mods on the market altogether, but especially if you’re just considering the best 100 watt box mods. The MVP4 also works in TC mode, supporting vaping with nickel, titanium and stainless steel coils, with a freely adjustable ramp up wattage. It performs fantastically regardless of mode, and will quickly become one of your go-to devices regardless of how you vape. The MVP4 has a great price for one of the most popular 100w box mod options on the market too, priced at just $57.95 for the device, the user manual and a USB cable for charging. The highest wattage isn’t necessarily the best wattage for vaping, and the good news is that there are tons of excellent options if you’re just looking for a 100 watt box mod. If you’re unlikely to need the excessive power outputs of some of the most widely-regarded vape mods, you can still find something that really packs a punch and that’s loaded with features. The best part is that you don’t need to pay much to find something capable and dependable, as many of the options on this list show. Choosing one specific device still won’t be easy, but you’ll get something that performs admirably no matter which one you settle on.